Removing the engine from the Vulcan Mean Streak isn't as daunting as it sounds. Make sure you have your service manual (this article is not going to rehash everything mentioned in it) and the necessary tools and equipment before you begin. Though this details the process for a VN1500P Mean Streak, most of what you'll see here is similar to other Vulcans. As you'll quickly see, this operation will also take care of changing the oil and coolant while you're at it. Front wheel chock. The manual recommends using jacks and holding the front brake, but I consider tying the bike to a wheel chock to be more secure. Your choice. Engine lift, such as the Harbor Freight, Craftsman or Larin ATV/Motorcycle lifts. Pans to drain oil and coolant. Ziploc bags to hold nuts, bolts and other parts as they're removed. Also a Sharpie to label the bags. After step 3, the order of these steps is not particularly important. Set your service manual somewhere nearby and refer to it regularly. These steps are not intended to replace the service manual. 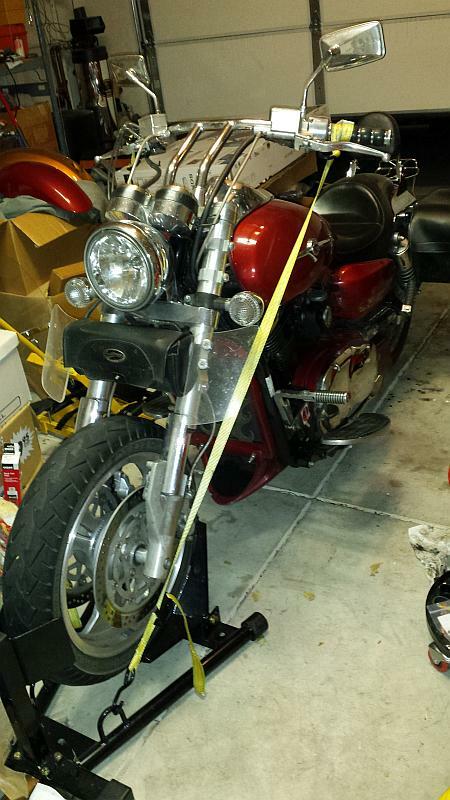 Secure the motorcycle in the front wheel chock. Note: If you have a Reaper or Long fender from Low and Mean, be careful what kind of chock you use. You might need to remove the fender first. At least one person has learned this the hard way with a broken fender. Remove the negative battery connector from the rear of the engine. Remove or loosen the left driver's peg bracket and shift lever. Note how the shifter is installed on the shaft (the positions of the index marks) so you can put it back the same way. Remove the left side cover and unplug all the electrical connections tucked in around the bevel gear housing. Each one is different so you needn't be concerned with mixing them up, just make sure you reconnect them all afterwards. Turn the driveshaft until the retaining pin is facing you. This will make it much easier to disconnect and reconnect the drive shaft from and to the engine. 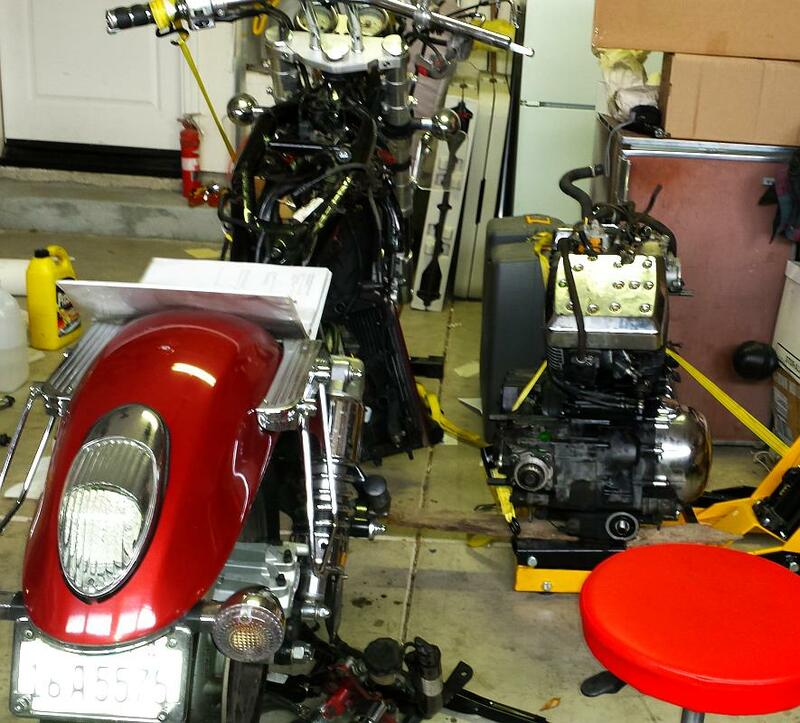 Raise the motorcycle with your lift enough to get the rear wheel off the ground. Pull the rubber boot at the drive shaft/engine connection back to expose the connection. Turn the rear wheel until you can see the pinhole. Remove the left-side air cleaner, if you have one. If you have an aftermarket air cleaner on the right only, it can stay. Remove the gas tank. Remove the upper part of the fuel inlet, just so there's less to hang up as the engine's removed. Unclip the wires running down the right frame rail. Unplug the rear brake light switch connector, located on the right near the radiator cap and behind the red connector for the handlebar controls. This way you don't need to readjust the switch when you put it all back together. Disconnect the fast-idle knob from its mount on the left downtube and tuck it out of the way. Drain the coolant and remove the radiator. You really only need to remove the bottom radiator hose, but I find it easier to just remove the top as well. Disconnect the positive cable from the starter motor on the front of the engine. Disconnect the coolant hoses for each cylinder where they connect to the cylinder. The first time the host clamps might not be in a good position to do this; in that case remove them from the themostat housing. When you put them back on, position the hose clamps on the cylinders so they can be reached by a screwdriver from the left side. 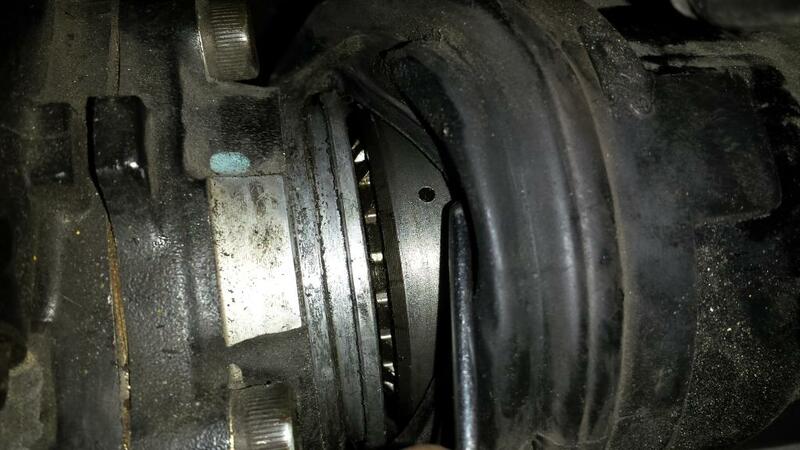 Disconnect the injectors and throttle position sensor from the throttle body. Disconnect the air pressure sensor from the throttle body, as well as the emissions hoses for CA models. Pry open the clip holding the throttle cables and remove it and the cables. I find it easier to first remove the right grip to give some slack to the cables. Another option: Remove the cables from the throttle grip and feed them through the frame as you remove the engine. This can be easier than trying to re-pinch that clip back in place after reinstalling. Disconnect the clutch line from the slave cylinder. The manual says to remove the slave cylinder; I've done it both ways and had to re-bleed the line either way. Get your lift under the engine and lift it slightly, just enough to take the weight off the suspension. I put some thin pieces of wood under the engine to stabilize and protect it a bit. 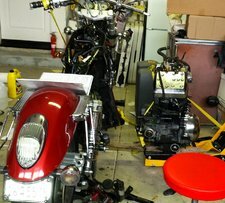 Kawasaki's recommendation for lifting the motorcycle is to lift by the lift points and the oil pan, so lifting the engine alone this way seems all right. Loosen the four motor mount bolts at the front and the four at the rear. If the bolts seem to bind or be excessively difficult to remove (after breaking them loose), adjust the lift to take more or less of the engine's weight. Remove the four bolts holding the right frame downtube and move it out of the way, along with the right-side controls. Disconnect the rear brake light switch or put the wiring out of the way if you already unplugged it (above). Pull back the driveshaft boot to expose the connection. There's a small hole in the collar (see the picture above); push a pick into that hole and you should feel some spring resistance. While pushing, move the drive shaft back and/or the engine forward a little to disengage the shaft. Be careful not to lose the pin! Putting a rag over the area will help prevent it from springing out and ending up on the other side of the garage. Gently roll the engine out to the right. Raise and lower the engine slightly and gently as needed to clear the frame. Keep watching for any wires or hoses that are connected or hanging up on other parts. Not surprisingly, installation is approximately the reverse of removal. Roll the engine back into the frame. Connect the driveshaft. This requires some finesse, you'll have to wiggle the engine forward and back, and probably adjust its height a few times to get it back on. Try not to pull forward much on the shaft or you'll need to check that it's still connected properly to the final drive. Note: If you put the transmission in neutral during disassembly, you can turn the output shaft to easily see the pinhole. Without the weight of the engine you should also be able to rotate the rear wheel (with a little muscle) so you can see where the pin goes, making reassembly much easier. If you just can't get the drive shaft engaged, you can always pull it out from the front of the swingarm to remove it. It's probably time for Swing Arm Lubrication anyway. Replace the mounting bolts. You may need to adjust the lift up, down, forward and back. It takes some effort to get all the holes lined up, but after this the hard part is done. Reconnect everything you disconnected prevously. Remember that the vacuum line from the throttle body goes to the rear pressure sensor closest to the TB. There are two sensors and they look identical. Be sure to check and bleed the clutch if needed. Replace your oil filter and fill the crankcase with oil. Refill the radiator with coolant. Replace your tank, console and seat. You're done! Take it out for a checkout ride.